A passenger plane-sized “void” has been discovered in the middle of the Great Pyramid of Egypt, where it has lain secret and untouched for 4,500 years, scientists revealed on Thursday. The space is one of four cavities, along with the king and queen’s chambers and “Grand Gallery”, now known to exist inside the giant monument constructed under pharaoh Khufu of ancient Egypt. 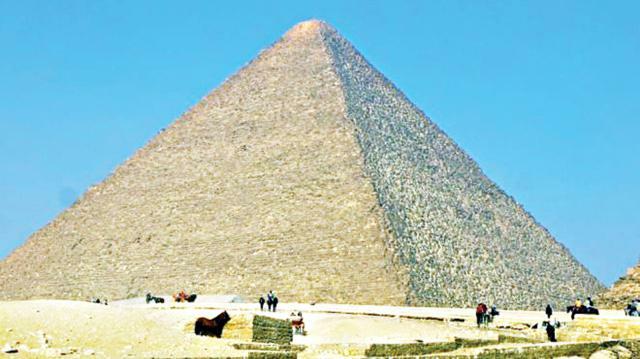 “It is big,” said co-discoverer Mehdi Tayoubi of the ScanPyramids project, which has been exploring Khufu’s pyramid since October 2015 with non-invasive technology using subatomic particle scans. “It’s the size of a 200-seater airplane, in the heart of the pyramid,” Tayoubi told AFP of the discovery, published in science journal Nature. Towering over the Giza complex on Cairo’s outskirts alongside smaller pyramids for kings Menkaure and Khafre and the Great Sphinx, the Khufu’s pyramid is the oldest and only surviving construction among the Seven Wonders of the Ancient World, and one of the largest buildings ever erected on Earth. The exact shape and size of the void is fuzzy—its purpose and possible contents a mystery. But it is thought to be at least 30 metres (98 feet) long, and located above the “Grand Gallery”—a sloped corridor almost 50 m long and 9 m high which links Khufu’s burial chamber at the pyramid’s centre to a tunnel leading outside.